We give the garments names not only for organization purposes, but to tie the inspiration into the collection. Also, when people see the garments listed in the program during the actual show, it doesn’t say things like “navy blue trouser,” or something boring like that. 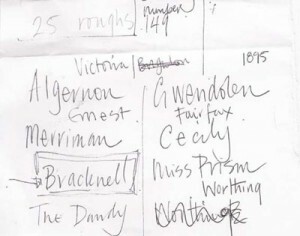 A couple of names we currently have are The “1906 dress,” “The Sunburst Trouser,” “The Lloyd Trouser,” and so on. 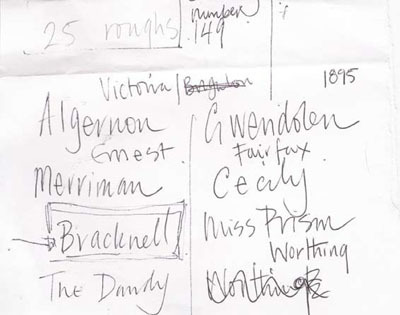 The names on the piece of paper scanned in include “The Dandy,” “Cecily,” “Merrimam,” “Algernon,” “Miss Prism,” and one we ended up using last week, “The Bracknell Dress.” The nicknames come from The Importance of Being Ernest; a literary inspiration for the collection. Previous Are you ready for a ‘Fashion Night Out’?